Thracian Celtic (?) Imitation of an Odessos bronze, struck in lead. Denomination : Lead 20 mm. Date : 2nd century BC. Reference : imitation of Sear Greek - 1678. Size : 18.2 x 22.0 mm. Weight : 4.97 grams. Obverse : Head of the city god of Odessos. The head is crude, but if you study it carefully the facial features are present. Reverse : Horse and rider pacing right. Part of the casting sprew from when the flan was cast is still present, and has bent up on the reverse side below the horse. It is Uncertain exactly who made these, but it is more likely Thracian tribes in the region around Odessos. 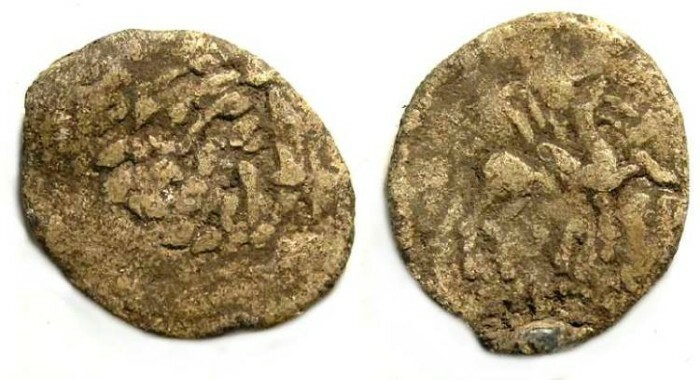 The original bronze coins from which it is copied were struck in the 2nd century BC and it is likely these are roughly contemporary with them.